It is a truth, universally acknowledged that 'Pride and Prejudice' sequels are usually best avoided at all cost, but not so with P.D. 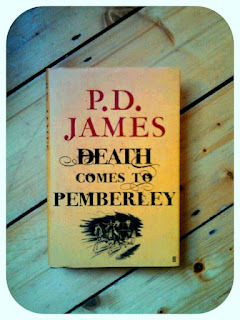 James's 'Death Comes To Pemberley'. It is a rare thing to finish a novel with such a sense of contentment as I feel on finishing this delicious book. Using the obligatory chocolate analogy, one would have to say that this book has all the feel of Galaxy chocolate, but with a slightly different flavour to it. Mint or perhaps cinnamon? The true wonder of this book is how well ninety-two year old novelist P.D. James captures the nuances and sensibility of Jane Austen's writing-style. Her diction is almost an exact match, with her pages of dialogue being the most impressive. There is not a syllable said by either Darcy or Elizabeth, now somewhat jarringly referred to as Mrs Darcy, that Austen herself could not have written. It is clear that James researched her subject meticulously, indeed she is herself a self-confessed Janeite and an Austen aficionado of the highest order. For me, P.D. James is to Jane Austen documentaries what Dame Judi Dench is to period drama: you really can't have one without the other. So to learn that James had decided to write the one definitive 'Pride and Prejudice' sequel seemed too good to be true. The result was an overwhelming success and from here on in, a line can be drawn under the whole Jane Austen prequel/sequel phenomenon. Quills down ladies - we have a winner! Let us consider the plot of James's novel. Without giving anything away, there is a murder at Pemberley some six years after Darcy and Elizabeth have set up home together. There is an inquest and a trial and that is it. In some ways the book begins and ends in the same way as 'Pride and Prejudice', with the arrival of a gallant stranger into the neighbourhood, with questions of the suitability of a possible suitor, and an ending very much in keeping with the Austen conventions that we are familiar with. Yes,the plot is indeed that simple, but as with Austen, the real delight for the reader is the interplay of characters and the sparkling dialogue. In this especially, James has kept true to the original style of the 'mother' novel. It is simply delightful to hear Elizabeth and Darcy re-visit moments from their past and take up where they left off from 'Pride and Prejudice',as if the intervening two hundred years, were as unimportant to the reader as an ad-break to modern television audiences. Similarly, characters like Jane and Mr Bennet wander into the story, using the phrases and idioms that we have long associated with these characters, and one cannot help but smile to hear them chime together in a worthy novel once more. And the resurrection of such familiar characters is not limited to the pages of 'Pride and Prejudice'. No indeed! We hear mention of Emma and Mr Knightley, Harriet and Robert Martin, from 'Emma' and Sir Walter, Anne Elliott and Captain Wentworth from the posthumous novel 'Persuasion', which serves only to enhance the pleasure for the more avid Austen fans. Indeed, aspects of the story reflect other novels too, such as 'Sense and Sensibility' and even 'Mansfield Park', but to mention them here might impinge on the enjoyment of others. One aspect of the novel which is entirely James's own, is her knowledge of the legal system during the Regency period,and an in-depth knowledge of the the physicality of murder and the damage that a blunt weapon can inflict on the human body. But fear not, this is not such a gruesome tale as all that, and the 'death' of the title, it seems to me, reflects more about the death of Darcy's pride than of anything else. He is forced to face the flaw that almost cost him his happiness with Elizabeth in the original text and to put old grievances finally to rest. Similarly, the atmosphere of the novel is also true to Austen's style. It glides along at a slow, elegant pace, with the quiet ease of satin-soled slippers on a marble floor. And it is this aspect of the novel that separates this sequel from all others. Being a novelist of such a high standing herself, P. D. James has, perhaps, not the pressures that less well-known, younger writers might have, believing that their novels must be rip-roaring page-turners if the reader is to remain engaged. Here James shows her master card; being of a generation that was born between the World Wars, where life did move at a slower pace than today, James can easily slip into the more authentic Austen style of writing, where life moves to a more leisurely rhythm, which is something to be relished and enjoyed in such a novel. The resulting effect of all this mimicry and mirroring, is to create a sense that the shadow of Jane Austen lurks amid the pages of this fine book. It is as if the long dead Jane is standing just behind the shoulder of the author, guiding her hand and smiling. There is nothing here to offend the staunch J. A. fan, so feel free to dispense with the guilt that Austen fans often feel as their hands reach out for the latest 'Pride and Prejudice' sequel. I often worry that I should not be wasting my time with some second rate sequel when I could be re-reading an Austen original. Yet here, we can have all of the enjoyment and none of the regret: we can return to Darcy and Elizabeth, while savouring the joys of a highly crafted novel by one of the great living writers in the English language. It's chocolate, but without the guilt? Now there's a novel thought. When I finish this book I'll choose another one to read. I really liked your blog, I'm following it.